Although its title does tell part of the story, this album could have been called Looser. A logical successor to the MOB Trio's OmniTone debut Loose, in some ways Quite Live in Brooklyn is even looser than its predecessor. "There's a special energy that happens when musicians play for an audience ... that changes the chemistry of how the musicians interact," says MOB's bassist Bob Bowen. Somehow, having an audience present increases our imperative to let go." That's partly caused by the natural give-and-take interaction with the audience, but also it's because of the way MOB —a trio of three accomplished composers and improvisers —approaches the music. "Our conception of time is broad; our conception of the composition is broad," explains Bob. This is apparent as the trio romps in an ego-free musical "space" where no one gets hung up on precision at the expense of emotional impact. "What happens with the MOB Trio is very emotionally potent, and that's a very fragile space. Because it's so present and so fragile, that emotion is sometimes hard to convey in a recording," admits Ohad Talmor, MOB's tenorman. "But, ultimately, what we do is Truth, and there are more than a few moments in the album where I feel like that emotional potency is really there." All the MOB Trio's members —Bob, Ohad, and drummer Matt Wilson —continue to spend time in "straight-ahead" ensembles where precision is paramount, but all three are careful to keep a balance between straight-ahead and looser settings. Saxophonist and composer Ohad Talmor performs with and writes for his own quintet Newsreel, The Other Quartet (co-led with trumpeter Russ Johnson), and his 7tet (also known as "7 Déjà Vus"), and he serves as musical director for the Lee Konitz Nonet and the Steve Swallow Sextet. He has performed with, among others, Steve Swallow, Dave Douglas, Chris Potter, the Carla Bley Big Band, and Ray Anderson. Ohad is also actively involved in writing for broadcast media, including music for NPR and the SciFi channel, as well as for film. Drummer and composer Matt Wilson, besides performing and conducting workshops with his Quartet and with his keyboard-based group Arts and Crafts, has performed with a veritable Who's Who of jazz. He has recently worked with Charlie Haden, Lee Konitz, Dewey Redman, Andrew Hill, the Herbie Nichols Project, Frank Kimbrough, and many others. In the six years since the MOB Trio came together, Matt, Ohad and Bob's paths have crossed in several ensembles —most notably, the Lee Konitz Nonet —giving them the opportunity to interact in a variety of settings, something that Ohad believes has affected how MOB feels and plays. "Everything comes home when we're playing together with MOB," notes Ohad. "The combination of different personalities and the repertoire, which is a weird combination of extremely complicated stuff that's very precise at some times, and at others played with complete abandon, makes us unique." The impact of MOB's playing —and the fun they have playing together —is also enhanced, according to Bob, by the fact that everyone in the band is an experienced "storyteller." [Editor's note: A colorful term meaning "manure spreader" was the actual term used.] Says Bob, "We never seem to lose our narrative sense of direction, because of the way the three of us work. We have a way of doing it where we don't conflict with each other or stomping on each other." It's not surprising, then, that many of the original compositions on Quite Live in Brooklyn have good stories behind them and that, coincidentally, "A Hundred Dollars" was written by Bob in memory of guitarist Cal Collins, a self-proclaimed master "manure spreader" —and someone from whom Bob says he got a lot of his ideas of openness and broadness in playing. The title comes from the only phrase Cal could exclaim to Bob all night following a gig during which Bob decided to ask Amy (now his wife) to marry him. After the guitarist congratulated him on his decision, Bob told him, "I figured I'd go out next week and spend a hundred dollars and pick up an engagement ring. He cuts me off and goes, 'A hundred dollars?! —A hundred dollars?! —A hundred dollars?!'" recounts Bob. "And that's all he kept saying." Likewise, Ohad's "Warmer in Heaven" was written in memory of a jazz musician: the late alto saxophonist Sam Furnace, a beloved figure in New York with whom both Ohad and Bob worked, and who succumbed to liver cancer in January of 2004. In addition to being another good storyteller, recalls Ohad about Sam, "He was really lovely, generous, open —all these things that make you feel good." Having lost his father from cancer not long before, news of Sam's death affected Ohad strongly. "A lot of the music I write is the result of emotional impact," reveals Ohad, "and that tune came out in just a half an hour." On a lighter note, "Play Some D" comes out of Ohad's love of the basketball and affinities he sees between the game and jazz, including a rhythmic dance component (which is evident in the groove of the piece) and having to make creative, split-second decisions when faced with any number of scenarios during a game. Though he enjoys playing hoops as his personal choice for "psychotherapy," the inspiration for the tune wasn't emotional impact. Clarifies Ohad, "No, that's emotional fantasy. I wish I were 6'8" and could play basketball." "Little Star" came to Bob in one fell swoop while on a break at a gig, several months after his daughter Stella was born. "She is the little star of my life. We've been through a lot of changes with her because, when she was born, we found out she had Down's Syndrome," explains Bob. "So, there've been a lot of emotional ups and downs going through that." "Suspicion" by Matt, according to Bob, "exemplifies the gifts Matt Wilson has as a composer, because we'd never seen it before. What's on the record is the very first time we ever tried to play this. He has a knack for writing tunes that are musical vehicles that can be put into a situation and just let go. You know, like winding up a top and then just letting it go." 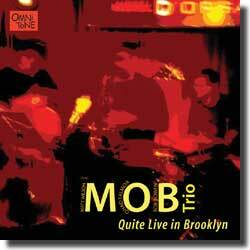 Though the immediacy, emotion, and groove of the live sounds heard on Quite Live in Brooklyn ultimately speaks for the MOB Trio and its music, it may be excepts from an interview with Ohad and Bob discussing the creation of "Peer Form IV" that are also quite "telling:"
Bob: "We labored over the score for months." Ohad: "This is our concept of tantric music; it comes at a very specific time of night." Bob: "Then we used a fugal part and a retrograde inversion." Ohad: "It's way past Lydian chromaticism. I mean, Boulez came up to us after he heard about it." Bob: "It's a whole new concept of harmony and rhythm." Ohad: "It's not even twelve-tonish, it's twenty-four tone music." Bob: "And in the measures on this one, there're five eighth notes to every quarter note." Ohad: "We should tell you about 'Peer Form VIII,' which is in process right now."